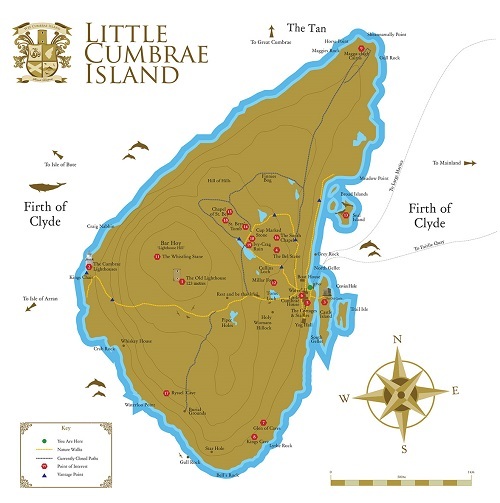 The magnificent, historical Scottish island of Little Cumbrae or Vey Cumra (pronounced Wee Cumra) has a long history of human occupation evidenced by prehistoric, bronze, and Iron Age archaeological remains. The origin of the name Cumbrae may have been derived from the early Celtic inhabitants of the Strathclyde region (the Cymry) or derived from a Gaelic word for shelter or refuge. Others believe it derives from another Gaelic word for a steep coastline rising from the sea. Situated in the Firth of Clyde off the Ayrshire coast, Little Cumbrae lies immediately to the south of Great Cumbrae with the Isles of Bute to the west and Arran to the south west. The nearest town is mainland Largs. The popular fishing town of Millport to the Southern end of Great Cumbrae is the nearest port to Little Cumbrae. Largs is 28 miles from Glasgow airport and 26 miles from Prestwick airport, both of which have regular flights from and to London as well as regular flights to London and other international destinations. Wee Cumbrae comprises 684 acres (277 hectares) and is approx 1.8miles in length and 0.9 miles at its widest point. The island is characterised by steep coastal cliffs and higher inland area steep bluffs which rise steeply in places interspersed with streams, several inland lochs and marshy areas. The highest point of the Island is Lighthouse Hill at 406 ft. The geology of the island suggests Little Cumbrae was formed originally from a series of volcanic lava flows. Due to the location of the island within the Gulf stream there are a wide range of plant species thriving on the island and there is an abundance of wildlife. Much of the early occupation is evidenced by burial mounds or cists, one of which contains the remains of an ancient chieftain warrior found complete with ceremonial sword, helmet and other effects. In the 7th century AD a nun established a religious cell on the island and there are still vestiges of the ancient ruined chapel of St Bey. Monk s cave (now known as Kings Cave) was used for sheltering from storms and hostile invaders. The castle keep is likely to have been built by Walter Stewart who was married to Marjorie, the only daughter of Robert The Bruce. The first royal charter was signed in the castle in 1375 AD and Robert II may have spent much of his time on the island hunting deer and rabbits. The Hunters of Hunterston occupied the island until 1515 when the island was passed to the Montgomereys and Earls of Eglington, following a dispute over the ownership over falcons with the Crown. In 1663, Archibald Hamilton was imprisoned on the island by the Sixth Earl of Eglington before he was sent to Stirling to be hanged. In revenge for this Oliver Cromwell, who was a friend of Hamilton, had the castle sacked and the building has not been occupied since. In the early 20th century, under the ownership of Evelyn Stuart Parker, a new mansion house was created from the original single storey farmhouse, the gardens were laid out to a plan by Gertrude Jekyll, the renowned garden designer, and substantial repairs were undertaken to the castle and the original lighthouse. The original work commenced in 1913, with subsequent alterations made between 1926 and 1929 when the square tower and top floor were added. The original lighthouse, situated at the highest point of the island (409ft) was built in1757 and comprised the 28 ft high tower with an open grate for a coal fire which served as the light. Within the Act of Parliament of 1756, the Crown was given the authority to levy one penny stirling per tonne for every British ship (excluding His Majesty s warships) and two pence stirling per tonne from any foreign vessels which passed the lights. Robert Stevenson built the lighthouse complex on the western sides of the island which came into operation in 1793, originally with the light generated by 32 oil lamps and silvered glass reflectors. The new lighthouse became fully automatic in 1997, at which point the former keepers moved back to their homes in Millport. Iconic to Wee Cumbrae, The Old Lighthouse built in 1757 is Scotland s second-oldest lighthouse. The 28ft high tower is situated at the highest point of the island (409 ft) with an open grate for a coal fire which served as the light atop Lighthouse Hill. Built by Robert Stevenson The Cumbrae Lighthouse came into operation in 1793. Originally the light was generated by 32 oil lamps and silvered glass reflectors. In 1826 this was upgraded with 15 argon lamps and then finally replaced in 1974 with a solar panel powered 107 watt light. The Cumbrae Lighthouse became fully automatic in 1997. The New Lighthouse complex has the original lighthouse and adjoining cottages with provision for a separate jetty access. The Cumbrae Lighthouse is fully functional and is currently maintained by Clydeport. The Old Castle Keep was built in the 13th century on three storeys, over a dungeon below, the tower was occupied by Robert II in 1375 and 1384. The vaulted great hall is on the first floor, together with the kitchen, extremely modern by the standards of the day. The castle has two vaulted cellars. The tower has a continuous course of beautiful chequered corbelling. The islet on which The Old Castle stood was formerly called Allinturail, that is, the islet of the noble s tower. THE AULD CASTLE was built prior to the year 1375, for in the spring of that year King Robert II made it his place of abode for a season. Cromwell s soldiers are reported to have surprised and burned the castle in the year 1653. The Bel Stane is located where the games and sports were held on the festival of the saint. Approaching it from the chapel, this great stone shows the form of a finely pointed pyramid five feet in height. The breathtaking gardens to Wee Cumbrae House extend principally to the eastern (front) and southern (side) of the main building, which is also extensively surrounded by stone-flagged terraces. Drawings from 1918 show the presence of a tennis lawn to the front of the main house, together with various terraced levels and pathway to the main jetty. Although much of the original Gertrude Jekyll planting scheme has lapsed, the general layout and planting proposals of the various areas still exist. To the southern side there is a formal rose garden, with a vegetable garden inland to the west. The central focus of the garden is a rose temple surrounded by a geometric diamond-shaped arrangement of beds planted with cannas, begonias, ricinus communis and dahlias in rich warm colours. Also the area around the large greenhouse includes a range of orchard trees including apple, plum and damson. The original Scottish farmhouse in this location was rebuilt and enlarged during the First World War, and subsequently extended in the 1920 s to form an imposing Victorian mansion house with a number of unusual features. The building has three floors and is constructed with stone and pitched slate roofs. There are several caves located in this area including Ocregman s Cave or cave of the bedesman. The name of this old hermit bedesman s cave is formed by adding the common term man to a Gaelic compound signifying the cave of the man of prayer-uagh fhir ghuidhe. King s Cave was previously known as Monks Cave and in the 7th Century AD, was used for sheltering from storms and hostile invaders alike. It is located at the base of the lofty cliff of Storrils-a cliff, which is on the west side of the lower part of Cosey-glen, the glen of caves. This cave of the old monks or Reimkennars (Culdee clerics or hermits) is over one hundred feet in length, and quite dry. The entrance to the cave is effected through a deep rift in the cliff, and is somewhat difficult to discover. Secure within its hidden recesses (where are high ledges to sleep on), the peapar or clerical fathers of Santa Vey must have often lodged here in evil times or when violence was feared. The polished smoothness of the sides of this cave is held to indicate the frequent inhabitation of it. The Magga-clagh [claff] Cairns on the northern point has been the reputed burying-place of Picts. When the largest of these cairns was opened in 1813, the Earl of Eglinton s men came first upon a sword of great length and weight, with a guard for the wielder s hand, next a hauberk of scale armour with iron byrnie or breast-piece, and iron guards for the wrist and back of neck. An iron casque or helmet was also found along with these, and a second sword so corroded by rust that it fell to pieces as soon as it was touched. Going farther down into the cairn the workmen came upon a short kistvaen, or chest of stone slabs, in which was found an urn, containing some brown dust and four or six fine white teeth. The two swords and the other pieces of armour belonged to one or more secondary interments, but the cinerary urn must be referred to some ancient chief of the Gadini or the Firbolgs. Named because of the cup-like hollow on the centre of its south face this stone has the form of a hemisphere, with cup sculptured on its plane face looking towards the true south, the diameter of which is 3 feet 3 inches, and that of the cup 4 inches. The depth of the latter nearly 11/2 inches. A work of man it is, but its meaning or purpose remains a mystery. The Whistling Stane is found on the western ridges of Barr Hoy the highest summit. Mysteriously a whistling sound can be heard at this point. Millar-Fort is a very old ruined stronghold on the hill to the west of the farmhouse, and its vestiges may be seen near the north margin of a small lake - Tammis-loch (Tom s Loch). Towards the East of Wee Cumbrae lies the picturesque home island to grey seals. Over 100 seals live on this small island in the firth and visitors can be assured to have a bright welcome as you pass them towards the entrance of Wee Cumbrae. The Chapel of St. Bey was approximately 42 feet in exterior length, 20 feet of which belonged to the choir or channel. The choir was 20 feet in exterior width, and was divided internally into two sections so as to allow one of them to be used as a prophet s chamber or lodge for the priest in charge. Located about twelve yards south-west of the Chapel of St. Bey there are a couple of rifled grave-cists, which have evidently been constructed of rude stone slabs after the manner of ancient, pre- Christian interments. There has been debate as to whether one of these formed the last resting-place of St. Bey or a pre-historic tomb of much earlier date. The South Chapel is ruins of what has probably been another chapel. As to length and breadth it seems to have been the almost exact counterpart of Santa Vey, and may possibly have been a reproduction of the latter upon a fresh site. Markle has good lime cement in its walls, one of which (the north) is three feet thick, and is still well seen. The priest in charge had a pretty large house or chamber attached to the north wall of the choir, but outside of it. The remains of this chamber show it had an interior area of about 18 feet by 10 feet. Close to the north wall of this exterior dwelling there is a squared block of sandstone fixed in the earth, while all round there is no rock but hard trap or clink-stone (of which the chapel is built). Ryssel s Cave is amongst one of the many caves on Wee Cumbrae. Located at Waterloo-bight, it is also known as the Cave of Champions. Bell-towers often found associated with ancient churches can be traced back to as early as the middle of the seventh century. Anyone standing near the chapel can, in clear calm weather, distinctly hear the striking of the hours on the clocks of the parish church and the cathedral, in the Greater Cumbrae, although the latter church is about 21/2 miles distant as the crow flies. Ivy-Crag Ruin is the remains of a very old 22 feet square house of considerable size and strength. There are over 75 species of birds that nest on Little Cumbrae, many of them rare and endangered species including the Cormorants at Cormorant Perch. Harbour Porpoises and Dolphins are regularly spotted in the upper reaches of the firth and in summer 2009, a new baby dolphin was welcomed to the Firth. Basking sharks are also living within the Firth in small numbers and are occasionally seen along with the elusive but present Minke whale.